Over the years we’ve spent a considerable amount of time at the famed ’21′ Club. The photo above, from our days on the gossip desk of a disreputable daily, is but one of many from a number of Scotch-soaked occasions at the storied watering hole. For a while we even had something of a regular salon going in the lounge; on those nights it was not uncommon to find the likes of George Plimpton, Whit Stillman and Jay McInerney mingling with supermodels and such, bringing a much-needed breath of fresh air to the admittedly stodgy surroundings. 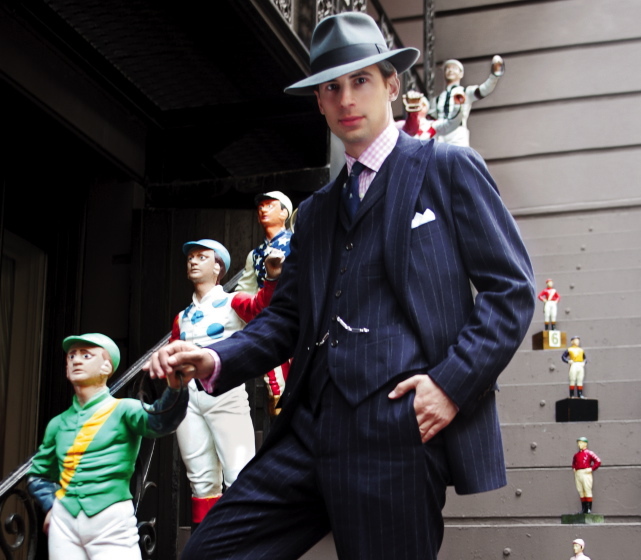 Steve Garbarino, our co-conspirator at many of these bacchanals, has just written an entertaining piece in the Wall St. Journal detailing the decline of the dress code at ’21′ and other establishments, with quotes from sartorial sages ranging from Tom Wolfe to Gilt MAN‘s Tyler Thoreson. Occasionally one of the guests at our shindigs would be quietly diverted upon arrival and pointedly offered the use of the club’s store of loaner jackets and ties. The latter is no longer required at ’21′ as Steve notes, part of a growing trend toward more casual dining at even the best of restaurants. We can’t help but think it’s not a good thing. This entry was posted in Style and tagged 21 Club, JPS, Wall Street Journal. Bookmark the permalink.